Imagine a future that looks a lot like…the 1800s. No technology or any modern conveniences; no commercial stores or shopping because people are back to growing their own food and making their own clothes; slavery is back in vogue because you need workers to do all this manual labor; and the class system is back in full effect since the world is made up of two kinds of people – the haves and have-nots. Kinda hard to wrap your head around, eh? Well, in Diana Peterfreund’s For Darkness Shows the Stars she manages to pull all this off while reworking Jane Austen’s last completed novel, Persuasion, as a dystopian love story. So how did we manage to destroy ourselves to the point that we went back to the old way of doing things?! Seems as modern science advanced and more and more people took advantage of genetic procedures that would enhance them as humans, a bad virus known as ERV struck these people which rendered them dead or at best mentally deficient (ie. dumb) and in need of care. Enter the Luddites, the people who from the very beginning trusted they were created in God’s image and took no part in any of these scientific experiments with our DNA. In fact, they hid in caves during the worst of the virus outbreak. When they eventually emerged and found much of the world wiped out and the rest “Reduced” (the word for what happened to those people who used science to tamper with God’s creation), they stepped in to do their Godly duty and care for the Reduced – by outlawing the technology that got them into this predicament and having the Reduced do all the work on their estates. Now that several generations have passed, though, there emerges another group of people known as Children of the Reduced – CoRs – who have intelligence but are still considered second-class citizens because they’re born of the Reduced. Some of these CoRs prefer to be known as Posts – as in Post-Reduced – and dream of a life beyond serving the Luddites. A life that once again embraces science and the good it can do if only their social standing didn’t hold them back. Elliot North is an eighteen-year-old Luddite who lives with her widowed father and older sister, Tatiana, on the North’s estate. Due to her father and sister’s extravagant ways, their estate is struggling and Elliot spends much of her time working alongside the estate’s Posts and Reduced to keep things running and somewhat profitable. She feels deeply responsible for all of their workers. When a letter arrives from an Admiral Nicodemus Innovation, requesting to use part of the North property to build a special ship that could sail and find if life on any other lands exists out there, Elliot quickly convinces her father to accept. Her family desperately needs the money Innovation is offering, and Elliot is intrigued because she’s heard that Innovation’s crews were responsible for discovering a breed of horse on a nearby island that is exceptionally strong and fast as well as chickens that produce twice as many eggs. As much as it goes against her Luddite upbringing, Elliot can’t help but believe science and invention can do some good after all. When Admiral Innovation and his Cloud Fleet of workers arrive, though, Elliot comes face-to-face with a ghost from her past – Captain Malakai Wentworth, whom she affectionately knew as Kai, her first and only love. Elliot and Kai grew up together on her father’s estate, since Kai and his father worked for the Norths. The two shared a fascination for the world and its scientific advancements before the Reduction, something they read a lot about in the books Elliot would sneak from her father’s library. As a CoR, though, Kai was considered beneath Elliot so they were forced to communicate mostly through written letters until, at age 14, something happened that caused Elliot to reject Kai and her feelings for him. Gutted by Elliot’s rebuff and determined to make a better life for himself, Kai ran away and joined with some other Posts living on the fringe of society. There, he met the Admiral Innovation and his wife, Felicia, and went through a transformation that changed the direction of his life…and possibly his chance of ever reconciling with Elliot. Obviously, Elliot and Kai’s tormented relationship is the centerpiece of the book. The course of their love affair is charted through the letters they begin writing each other at age six, until their big confrontation and falling out over how much one’s birthright and responsibilities ultimately matter if two people truly care for each other and want to be together. When Kai returns, his and Elliot’s feeling for each other are still there, but so are the same burdens of class, ambition, and how much science is too much science that drove them apart. The interest Kai shows in a nearby estate girl, who though also a Luddite doesn’t seem bothered by his Post status, only deepens Elliot’s longing to break free of old traditions and be with him herself. Unfortunately, Elliot carries the burden of maintaining her family’s property so she can provide for all the Reduced and Posts who depend on her family – but as Kai challenges her, what if they want more for themselves than to work till death on her land? Should a person be reduced to being either a manual laborer or a property owner by birth only? And what of science? Is it all bad? If there are technologies out there that can make life easier for people, why not take advantage of those tools? Peterfreund deftly addresses these issues of class and science not only in regards to Kai and Elliot’s relationship, but also in how the Luddites sincerely believe they are doing God's work by adhering to traditional ways and providing a home and work for society's weaker citizens, essentially modern day slaves. As with all Jane Austen novels, you don’t just sit and read the book – you allow yourself to become a part of its world, a world which places a lot of emphasis on class and tradition. That Peterfreund can pull that off in this modern take is quite a feat. 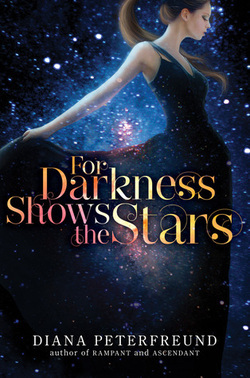 Peterfreund has also written a prequel for For Darkness Shows the Stars called Among the Nameless Stars, which is about what happened to Kai during the time he ran away from the North’s estate. You can read it for free on her website at http://www.dianapeterfreund.com/ . Peterfreund will also be one of the authors at this year's YallFest in Charleston, SC.